You need to make sure you have the Unassigned Work Extension Installed in order to use Unassigned Work. To add categories to the unassigned work extension. Login to your account, navigate to Settings and choose Unassigned Work from the sidebar. From here you will be able to add as many categories as allowed. Each category consumes 1 unassigned license. You can purchase licenses from the Unassigned Category page or when you are subscribing. To add or remove unassigned work licenses. Login to your account, navigate to Settings and choose Unassigned Work from the sidebar. Choose “Add More Licenses” and you will be presented with a pop-up allowing you to manage your licenses. Choose the ‘x’ button located to the right of the category. Clicking it will show a modal which you need to confirm deletion. Deleting a category will free up a licenses. Please note, that deleting a category will delete all scheduled bookings on that category. If you are unsure, please create a new category as there is no undo. 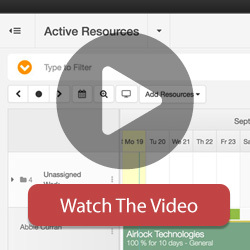 To schedule unassigned work, navigate to the scheduler. All unassigned categories should be visible at the top of the scheduler, if not, click the Unassigned Work Label on the left. Booking Unassigned work is easy. You can schedule them on the scheduler the same way you would schedule a Project. To the right of each unassigned work row, there is a menu which provides various options around Unassigned Work Rows. The following logical rules apply to Unassigned Work. Unassigned Work can be added to a Project. Unassigned Work can be added to a Project Group. Unassigned Work can be added to a Resource Group. You cannot add an unassigned work row to a resource. You can add to a resource group. Unassigned Work reports can be generated from the report templates.